Certain interpretive issues created by the circular may require further clarifications from CBDT. Recently, on November 07, 2017, the Central Board of Direct Taxes (“CBDT”) released a circular1 (“Circular”) exempting certain investment funds, including private equity (“PE”) and venture capital (“VC”) funds from the applicability of the indirect transfer provisions (“ITP”) under the Indian Income Tax Act, 1961 (“ITA”). The Circular follows up on the statements made by the Finance Minister while delivering the Union Budget earlier this year for addressing concerns of the PE /VC industry around this issue. Yet it falls short of industry expectations as well as of the ambit alluded to by the Finance Minister in his speech. Section 9 of the ITA contains provisions under which income, upon the fulfilment of certain conditions, accruing to a non-resident is deemed to accrue in India and is accordingly brought within the Indian tax net. In order to overcome the impact of the Supreme Court of India’s ruling in the Vodafone case2, the Finance Act, 2012 amended the aforesaid Section 93 to include ITP with retrospective effect such that if an asset, being a share or interest in a company or entity4 registered or incorporated outside India, derived its value, directly or indirectly, substantially from an asset situated in India, the gains arising from the transfer of such share or interest would be taxable in India. Due to the expansive scope of and language used in the amended provisions, a number of concerns were raised by stakeholders including FPIs and PE / VC investors, which led to the mandate of the Shome Committee5 being expanded to examine the applicability of the indirect transfer provisions. Thereafter, the Finance Act, 2015 further amended the provisions of Section 9 to incorporate some of the Shome Committee’s recommendations. The amendments included the provision of a de minimis threshold for the applicability of ITP, a clarification on the meaning of “substantially derive value” from India and a carve-out for the applicability of ITP vis-à-vis small shareholders. However, the constant tinkering with the ITP did not address numerous genuine situations, in particular redemptions by offshore funds to distribute gains made from India. In fact, the multi-level taxation arising from literal interpretation of the ITP was highlighted in a circular issued by CBDT in December 20166 (“2016 Circular”, a detailed analysis of which can be found here), which alarmed many stakeholders in the funds industry. Several representations were made by the funds industry regarding the harshness of the ITP, as interpreted by the 2016 Circular, and soon after, the CBDT issued a press release7 keeping in abeyance the operation of the 2016 Circular (an analysis of the press release can be found here). “In 2012, Income-tax Act was amended to provide for taxation of those transactions of transfer of shares or interest in a foreign entity deriving its value substantially from Indian assets. Apprehensions have been raised about some difficulties which arise because of this provision in case of transfer of stake of investors of India-based funds located abroad but investing in India-based companies. Accordingly, via the Finance Act, 2017, investments held in Category I and Category II Foreign Portfolio Investors (“FPIs”) were excluded from the ambit of ITP.8 However, Category III FPIs, and PE / VC funds which tend to invest under the foreign direct investment (“FDI”) and foreign venture capital investment (“FVCI”) routes, continued to remain affected by the ITP. The industry has been expecting clarification in line with the Finance Minister’s observations i.e. to not apply ITP to situations where the income is already undergoing a level of taxation in India. In this background, the Circular was issued. The Circular takes note of the concerns raised by PE / VC funds regarding the applicability of the ITP, especially to multi-tier investment structures. The Circular observes that there could be multi-tiered investment structures wherein interests or shares are held indirectly by a non-resident in ‘Specified Funds’. The Circular defines ‘Specified Funds’ to mean (i) an Investment Fund (as defined under Section 115UB of the ITA)9 or (ii) a Venture Capital Company or a Venture Capital Fund (as defined under Section 10(23FB) of the ITA)10. Specified Funds are tax pass-through vehicles under the ITA i.e. investors are subject to tax as if they had directly invested in the portfolio companies held by the Specified Fund. In this regard, the Circular provides that the ITP shall not apply in respect of gains arising to a non-resident on account of redemption or buyback of its share or interest held indirectly in the Specified Funds if (i) such income accrues from or in consequence of transfer of shares or securities held in India by the Specified Funds (“Indian Transfer”); and (ii) such income is chargeable to tax in India. It is further provided that the above benefit shall be applicable only in cases where the redemption or buyback proceeds arising to the non-resident do not exceed the pro-rata share of the non-resident in the total consideration realized from the Indian Transfer. Also, non-residents investing directly into the Specified Funds shall continue to be taxed as per the ITA. In order to understand the Circular further, reference may be made to the following illustrations. Illustration 1 depicts a situation where the non-resident holds an indirect interest in the Specified Fund, and the income arises to the non-resident on account of an Indian Transfer. Illustration 2 depicts a situation where the non-resident holds an interest in an offshore fund which directly invests into India. All categories of offshore funds not covered: A large proportion of the PE / VC funds use either a standalone offshore model i.e. where there is no Indian vehicle and the offshore fund directly invests in India or a co-investment model for investments into India i.e. where the Indian vehicle pools domestic investors and co-invests along with an offshore vehicle which pools offshore investors and invests directly into Indian securities. The concerns around the capital gains implications of redemptions and buybacks by the investors in the offshore vehicles in such multi-tier structures has not been addressed, although these concerns have in fact been recognized in the Circular as well as the Finance Minister’s Budget speech. To avail the exemption under the Circular, the non-resident to whom the income accrues or arises should be holding an indirect interest in a ‘Specified Fund’. Specified Funds have been defined to refer to either alternative investment funds or venture capital funds registered with SEBI, and accordingly, should be an Indian vehicle. 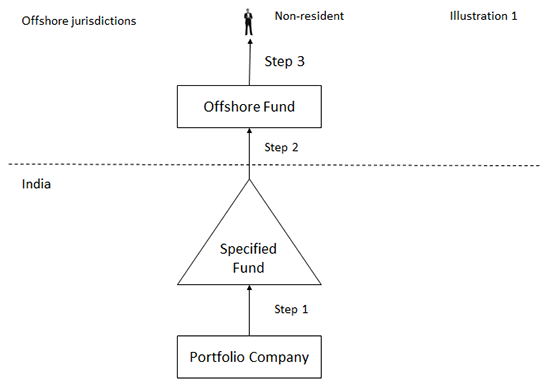 Consequently, the benefit of the Circular does not extend to investors in offshore funds which have made direct investment in India (situation depicted in Illustration 2 above). Often, especially with the revision of various tax treaties, offshore vehicles are subject to taxation in India with respect to disposal of their direct investments. Upstreaming of such gains by way of redemption or buyback can also be similarly subject to multiple levels of taxation due to the application of ITP. However, the Circular, by mandating the requirement of an investment in a Specified Fund, has not provided a similar benefit for direct offshore investments which are chargeable to tax in India. Prospective applicability: The Circular is applicable on a prospective basis for future redemptions / buybacks by investors in Specified Funds. However, considering the retrospective applicability of the ITP, past transactions/redemptions undertaken by such fund platforms could also be subject to ITP. This is unlike the exemption extended to investments in Category I and Category II Foreign Portfolio Investors (“FPIs”) in Finance Act, 2017 which was granted on a retrospective basis. On a going forward basis, the Circular favours the setup of Indian fund entities even for predominantly global fund platforms. From a structuring perspective, unified structures with an offshore feeder feeding into an Indian Specified Fund may be preferred from a tax perspective. In his Budget speech, the Finance Minister appeared to suggest that income of a non-resident should not be subject to ITP if it arises out of a redemption or sale of investment which is chargeable to tax in India. Therefore, to qualify for an exemption, the Offshore Fund’s income should be chargeable to tax in India. The language of the Circular creates some ambiguity as to the level of upstreaming at which the income should be ‘chargeable to tax’ in India. There seems to be some ambiguity on whether the Circular requires that the income in generated in Step 1, Step 2 or in Step 3 should be chargeable to tax. The fact that the Specified Funds are tax pass through vehicles further increases the confusion in this regard. The interpretive crux of the Circular revolves around what can be considered to be income ‘chargeable to tax’ in India. If income is not includible in total income on account of specific exemptions under the ITA, would it still qualify as “chargeable to tax”? For example, long term capital gains on sale of listed shares are generally not included in the scope of ‘total income’ as long as securities transaction tax is paid. Since chargeability under the ITA extends only to total income, it is unclear whether such exempt income would be considered as being “chargeable to tax”. Further, if the income tax exemption hinges on the payment of securities transaction tax, it is unclear whether that would make such income qualify as being “chargeable to tax”. The benefit under the Circular is only provided to the extent that the income of the non-resident does not exceed its pro-rata share in the total consideration realized from the Indian Transfer. The rationale behind the introduction of such a condition is uncertain. However, it may affect certain profit sharing arrangements which are commonplace in the funds industry. For example, offshore fund managers often enter into profit sharing arrangements for carried interest, wherein their share in profits may exceed the pro-rata share in terms of contribution. To the extent of such excess, the offshore manager may be subject to ITP if the carried interest distribution is effected through redemption or buyback of the shares or interest. This potential application of ITP to carried interest may affect the structuring of profit sharing arrangements in offshore fund vehicles. While the issuance of the Circular by the CBDT is significant, the fine print of the Circular leaves a bittersweet aftertaste for industry participants owing to the ambiguous wording, and limited scope. PE / VC funds following standalone offshore or co-investment models continue to be affected. The Circular gives a further push towards unified structures with Indian modules to fund platforms. Apart from the above substantial issues, on an interpretive front, the Circular creates ambiguities which may need further clarifications – including the ambit of the phrase “chargeable to tax”. 1 Circular No.28 of 2017. 2 The Supreme Court, in Vodafone International Holdings BV v. Union of India, had held that gains arising from the transfer of shares of a foreign company (resulting in the indirect transfer of shares of an Indian company) would not be subject to capital gains tax in India. 3 Explanation 5 to Section 9(1)(i) of the ITA. 4 The usage of the word “company” shall be deemed to include reference to “entity” and the usage of the word “share” shall be deemed to include reference to “interest” and / or “unit” unless the context otherwise requires. 5 The Shome Committee was constituted to receive comments and undertake widespread consultations from stakeholders and vet and rework the general anti-avoidance rule (“GAAR”) guidelines. 6 Circular No. 41 of 2016. 7Press release dated January 17, 2017 titled “Clarification on Indirect Transfer provision under the Income Tax Act, 1961” issued by the CBDT. 8The FPI route is the primary route for institutional investments into the Indian listed space. It is regulated by India’s securities regulator, the Securities and Exchange Board of India (“SEBI”). 9Section 115UB(1) of the ITA defines an Investment Fund as meaning a Category I or Category II Alternative Investment Fund registered with SEBI under the SEBI (Alternative Investment Funds) Regulations, 2012. 10Section 10(23FB) of the ITA defines Venture Capital Company and Venture Capital Fund as Venture Capital Funds registered with SEBI under the SEBI (Venture Capital Funds) Regulations,1996 or as Category I Alternative Funds under the SEBI (Alternative Investment Funds) Regulations, 2012, fulfilling prescribed criteria. 11 CBDT Notification No. 91/2008; Bank of Tokyo-Mitsubishi UFJ Ltd. v. ADIT, ITA Nos. 5364/Del/2010 and 5104/Del/2011.